Duluth native Lauran Paine was one of the most-published authors in the world. He was best known for his westerns, but he also wrote romance, mystery, and science-fiction novels and non-fiction books. He published over 1,000 books under about 80 different pseudonyms and in the 1980s was listed in the Guinness Book of World Records as the world’s most prolific author. Lauran Paine’s birth name was Lawrence Kerfman Duby Jr. He was born on February 25, 1916, in Duluth to Lawrence Kerfman Duby and Arla Bosworth Paine Duby. Lawrence Duby Sr.’s family had moved to Duluth from Michigan in the 1890s, when Lawrence Sr. was a small child. He attended school in Duluth through tenth grade at Central High School, where he was sophomore class president for the 1909–1910 school year. Following that year, he transferred to the Phillips Academy in Andover, Massachusetts, working summers in Duluth as a playground instructor. He graduated from the Phillips Academy and returned to Duluth to work for the city’s parks department. The author’s mother, Arla Bosworth Paine, was born in Duluth on December 31, 1893, to Franklin and Antoinette Paine. Franklin was a Civil War veteran living in St. Paul after the war. His cousin, James M. Paine, came to northern Minnesota in 1869, first starting a lumber mill in Oneota Township (much of today’s West Duluth), and then in 1870 moving the operation to Northern Pacific Junction, which would become the village of Carlton. Franklin and his brother Mark both came to the Duluth area to work with James. Mark continued in the lumber business, later becoming the first mayor of Carlton. Franklin moved to the Zenith City in 1885 to work as a cashier at the Duluth National Bank. He soon started his own brokerage business, Franklin Paine & Co., dealing in wheat, corn, flax, barley, and oats. Later he was manager of the Duluth Board of Trade. He was also an inventor, patenting his design of a tobacco pipe in 1896. Franklin and Antoinette were married in Superior on November 21, 1885. Antoinette ran her own needlework and fabric business in downtown Duluth for several years. Both Paines were very active in Duluth society. During World War I, Antoinette worked with the Red Cross and other local war relief efforts. In addition to Arla, they had two older children born in Duluth: a daughter Frank (yes, Frank), born September 23, 1887, and son Lauran Bosworth, born on June 16, 1890. Lawrence Duby Jr. and Arla Paine perhaps met while students at Central High School in 1909, when he was a sophomore and she a freshman. It was the next school year, when Lawrence was a student at the Phillips Academy, that Arla’s brother Lauran, a 1908 graduate of Duluth Central High School and left tackle on the school’s football team, died in Ithaca, New York, while a student at Cornell University. He had been injured in a football scrimmage on October 18, 1910, and died in the college infirmary on October 27 of what was later determined to be a heart ailment. His funeral was on November 3 at his parents’ home at 5349 London Road in Duluth. Lawrence and Arla were married on January 21, 1914, in San Francisco, California, at the home of her sister Frank, who was married to journalist Waldemar H. F. N. de Bille in 1912. By May of that year, the Dubys had returned to Duluth. On December 18, 1914, their daughter Nancy Antoinette was born in Duluth, and in 1916 Lawrence Jr. was born. Lawrence Sr. was working for the city Parks and Recreation Department as an assistant recreation director, mostly organizing youth sports leagues and teaching boxing and other sports at city playgrounds. For several years he and Ray W. Fenton ran the Fenton-Duby Co., an athletic supplies store at 26 N. Fourth Ave. W. in Duluth. During World War I, Lawrence served as a lieutenant, junior grade, in the Naval Militia. The Dubys and their two children left Duluth for Los Angeles, California, about 1921. The Dubys separated and divorced in the early 1920s. Arla moved to Chicago where her sister Frank and her husband had moved. Arla’s daughter Nancy stayed with her, while Lawrence Jr. spent time with his mother, grandparents, and the de Billes. He also attended private schools, including the Pacific Military Academy in Culver City, California, and the Sycamore St. Alban’s Episcopal Academy in Illinois near Chicago. On August 14, 1930, his sister Nancy died in a car accident at the age of 15 in Evanston, Illinois. Lawrence reportedly set off on his own at an early age to work at a variety of jobs on ranches, where he learned his cowboy skills. He also competed in rodeos and performed as a stunt rider, appearing as an extra in several Johnny Mack Brown western movies and in the 1936 production of The Charge of the Light Brigade. Around this time, Lawrence legally changed his name to Lauran Bosworth Paine, presumably to honor his mother’s older brother who had died so young. According to Paine himself, around 1934 he was working on a ranch in Colorado and found a stack of western magazines in the bunkhouse. He was fascinated by them, but he was also disturbed by how poorly researched and full of errors they were. He began to write his own western short stories and submitted them to the pulp magazines, but without success. On July 5, 1938, he married Esther Conklin in San Francisco. They eventually had two children, Robert Treat Paine and Lauran Bosworth Paine Jr. Paine joined the Navy during World War II, and continued writing following his discharge. After the war, he found some success with publishers, selling about sixty short stories to the western pulp magazines. By 1948 he was writing full-time. This was when he began his regimen of writing eight hours a day, seven days a week. One of his first novels, 1950’s Adobe Empire, is a fictionalized account of the life of trader William Bent. More novels followed that same year, all published in Great Britain by Hamilton & Co. In a year or so, he had a following in the United States. His early westerns include Geronimo!, Timberline, The Bounty Hunter, and Californios, all published under his own name. Soon Paine was also publishing western novels under various pseudonyms, including Frank Bosworth, Will Bradford, Concho Bradley, and Will Brennan. His son Lauran Jr., himself now an author, remembers his childhood bedroom was next to his father’s den. Young Lauren would be awakened early in the morning by the sound of his dad’s pounding on a manual typewriter. Paine’s 1955 western novel Lawman became the 1957 movie The Quiet Gun, which starred Forrest Tucker, Jim Davis, Kathleen Crowley, and Lee Van Cleef. Lauran Paine continued to write and publish fiction and non-fiction books for the rest of his life. 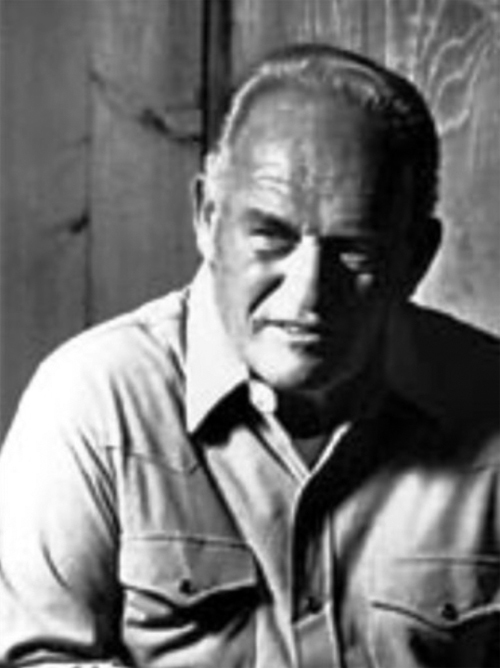 In addition to the westerns, he wrote mystery novels under pseudonyms such as John Armour and Robert Clarke, romance novels as Kathleen Bartlett and Amber Dunn, and many non-fiction titles. In the early 1950s he moved from his home near Los Angeles to northern California, first in the Hornbrook area and in the late 1950s to Fort Jones. His wife Esther served as his typist and assistant, but after 43 years of marriage they divorced in 1982. On June 26, 1982, Paine married Mona Lewellyn Shaffer. Mona was a reference librarian at the Siskiyou County Library in Yreka, California, and she had met Paine when he visited the library with reference questions relating to research for his books. For their remaining years together, Mona served as his typist and partner. She took early retirement so she could devote more time to helping with his work. Mona says at that time of his life he wrote every day from 4 a.m. until 2 p.m. He also worked as investigator for the Siskiyou County District Attorney’s office and taught creative writing at the College of the Siskiyous. In 1990 Paine published the western novel Open Range Men, and the movie rights were eventually purchased by Kevin Costner. The movie, Open Range, was released in 2003 and starred Costner, Robert Duvall, and Annette Bening. Unfortunately, Paine didn’t live to see the premiere. He died in Yreka on December 1, 2001, at the age of 85. In the end, he had published over 1,000 books, but had written a total of 1,238 books, according to Mona. She passed away on June 9, 2013. Paine’s son Lauran is the trustee of the Lauran B. Paine Literary Trust and is in the process of republishing some of the earlier books.